Hello! We haven’t been hibernating – honest! So finally, all back bright eyed rosy cheeked and wet nosed! If you are too, have a look at our Flags & Flag Gifts section in our Gifts category. There’s everything you’ll need from just £1! New this year – St Piran Flag Ribbon -St Piran Flag Doggy wear! Easter Eggs will be rolling in first week in March! 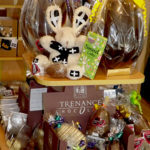 Only the very best made in Cornwall Easter Eggs will do for us! HOT CROSS BUN FUDGE HOT CROSS BUN CHOCCIE SIMNEL CAKE CHOCCIE! MR AND MRS BUNNY beautifully handknitted in Cornwall. « OH! NO….VEMBER! IT’S NEARLY GONE!